Photo of brown bear by Xavi Vicient. Cantabrian bears and the problem of lack of carrion for Spanish bears. Following on from news of possible return of bear to Galicia, here's a photo of an alveriza (known as cortines in Asturias). These old constructions were built to protect beehives from bears. Note, the hives were positioned together to capture the maximum amount of sunlight. Photo from here. More on bears and bees. Christmas present idea. 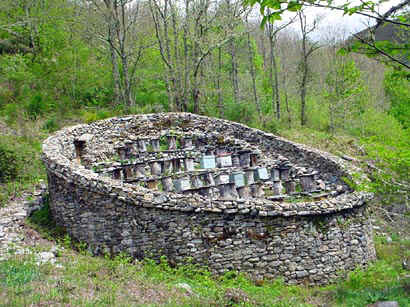 Fapas in Asturias will install your very own sponsered unprotected beehive so bears can gorge on it. 413 sponsered so far. 57 euros here. 26/11/2006 More bears in the Cordillera Cantábrica. King of Spain Juan Carlos I, who was on a visit to Russia in August, has killed a domesticated bear, as Sergey Starostin, deputy head of Vologda Region's Hunting Grounds Preservation Department, reported to Vologda Governor Vyacheslav Pozgalev. What is more, the king made the bear drunk. Juan Carlos I visited Vologda Region in late August. The king and his retinue stayed at the House of the Wood Grouse recreation zone near the village of Limonovo. The place had earlier welcomed celebrities as film director Nikita Mikhalkov, Russian Emergency Situations Minister Sergey Shoigu and former Finance Minister Mikhail Zadornov. The Spanish guest did not make a secret of the fact that he had come to that middle of nowhere only because of hunting. Two months after the visit, details of the royal hunting have leaked. 30/07/2006 This month's print edition of Quercus, Spain's best wildlife magazine, has an article by FAPAS on the importance of carrion for Cantabrian brown bears. As a result of the mad cow's crisis, in 2001 EU passed a law forcing all dead sheep, cows and pigs to be destroyed. Prior to this some 17,000 animals were left every year in the Spanish countryside, a vital resource for wildlife. While birds (vultures and other carrion eaters) have been saved form the worse effects by the setting up of cordoned-off feeding stations with controlled corpses, no help has been given to mammals. Carrion is a vital food source for Cantabrian brown bears, particularly in winter and early spring when other foods are scarce. Unlike other bears, Cantabrian bears hardly ever attack live animals. Here a a Somiedo bear tucks into a mule (? ), exempt from the Mad Cow rule. Thirty bear cubs were born in the Cordillera Cantabrica in 2005, the highest figure for at least 20 years. 24 were born in the Western Sector to 12 females. This area now covers some 2,100 km2, compared with 2,100km for the Eastern Sector. The population in the former has been rising at 7.5% a year and is now considered as viable by most experts.Six of the cubs were born in the much-maligned eastern Cantabrian population of bears, the highest for 15 years, and double the average for the period. Three females gave birth to three, two and one cub, respectively. Five cubs were born in 2003 and two in 2004. Treinta oseznos nacieron el pasado año en la Cordillera, la mayor cifra en 20 años (Nuevo España). Interview with Guillermo Palomero, President of Fundación Oso Pardo here. Details in English when I get round to it. There are already two ski resorts, Alto Campo and San Isidro , servicing the populations of Santander , Oviedo and León. The project for the San Glorio pass is seen as being unsustainable due to its' relatively low altitude and proximity of the Atlantic causing uncertain snow conditions. Downhill skiers in the know head for either the Pyrenees or the Alps . Apart from the destruction of this mountain environment, capercaillie and river trout are also under threat. As with the bears, the corridor linking the eastern and western population pockets would be lost. In addition to money spent on compensation, fencing and habitat improvement, 8 specially trained dogs were given to livestock owners. In there were 2005, 58 records of bears in Catalonia (43 in Val d'Aran, 12 in Pallars Sobirà, 1 in Pallars Jussà and 2 in l'Alta Ribagorça). 28 attacks, 15 tracks and excrements, 11 sightings, 1 photo and clots of hair. Possible presence of bear with a cub. Western Pyrenees 4 males (2 autochthonous, 1 introduced, and 1 male of mixed parentage). Full report here in Catalan including description of each ane every bear and their parentage: Seguiment de l'ós a Catalunya Thanks to Juan Carlos of Juan Carlos Fernandez of Grupo Aves Exoticos de Catalonia for sending me this news. Latest estimate puts Cantabrian Brown Bear population at 170. Not all good news though. 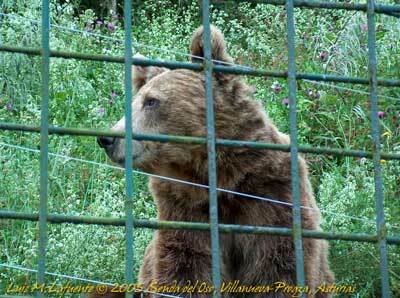 France is to release five Slovenian bears to North of Val d’Aran and Monte Perdido. The original plan was to release 15 animals, and doubling at a stroke the entire Pyrenean population, but the fears of farmers and livestock owners, particularly on the Spanish side, has led to a more gradual approach. The opposition in the Spanish Pyrenees is in stark contrast to the bear loving Asturans and Cantabrians, where the animal is proudly seen as a sign of regional identity. Bear experts from the Cordillera Cantabrica note that the same arguments now raging across the villages of the Pyrenees were held 20 years ago in the Coridllera Cantabrica, during the campaign to save the bear there. The bears will be released between April and June in part to replace the three bears release between 1996 and 1997 -Melba, Claude and Cannelle- which were killed by hunters. The places chosen sensibly are municipalities which have been favourably to the reintroduction: Arbas, Bagnèresde-Luchon and Burgalays (Alt Garona), and Bagnères-de-Bigorre (Alts Pirineos), to the north of Val d´Aran and Monte Perdido in Spain, respectively. The bears will be followed by a French team made up of a biologist, a vet and three assistants. This is only the start of the reintroduction programme as at the area will need at least 100 bears to be anything like viable. There are currently 10-12 animals in the Eastern Pyrenees and another 4-5 in the western part of the chain. Opposition means this will be done gradually. The French government notes that not a single person has been killed by a bear in the last 150 years in the Pyrenees. - Webcam for Paca and Tola. From mid-June we'll be able to watch Paca and Tola from a webcam over the internet. (Paca and Tola are two female bears who were orphaned in the 1980's when a hunter killed their mother. I saw both Paca and Tola taking a bath this August as we all watched on, sweltering outside their enclosuse. My photos were crap snaps. Much better this photo of Tola by Luis Lafuente. More of his work here on iberianature or on Luis' own page http://grado.grao.net. (Gracias Luis por estas noticias) The bars in the photo are deceptive. The couple have several hecatres of forest and crags in which to roam. 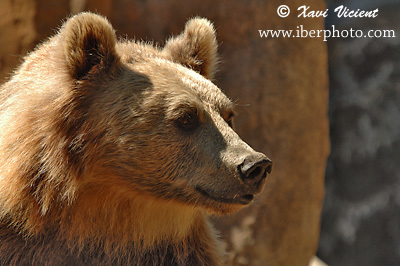 - Review of 2005: Brown bear on the rise in Asturias and Cantabria. French biolgists are to travel in April/May 2006 to Slovenia to help capture five brown bears (4 females and 1 male). The animals will then be moved to the French Pyrenees and immeadiately released in an area yet to be determined. The capture and transfer of each bear costs around 10,000 euros an animal and is financed by the EU - Slovenia is not charging for the bears. The release follows in the line of the 1996 and 1997 programme when three Slovenian bears Giva, Melba and were also released in the Pyrenees. There are an estinmated 500 bears left in Slovenia. Just 16 - 18 remain in the Pyrenees distributed in three areas. The long-term objective is for a population of some 100 bears. (Various sources). Middle Ages. Bears and other large fauna abundant through much of Spain . Contemporary accounts tell of travellers choosing not to travel at night for fear of being attacked by beasts. Only nobles have the right to hunt bears. Bears were plentiful around Madrid - herein probably lies the origin of Madrid 's shield El Oso y el Madroño (The Bear and the Strawberry tree - a favourite morsel of bears in Spain ). The area around Madrid was known as Ursaria for some time. The Libro de Montería (Book of the Hunt by King Alfono XI states: Madrid , un buen lugar de puerco y oso ( Madrid a good place for swine and bear). 15th Century Pyrenees bear population still connected with Sistema Central, Montes de León, Zamora and Gredos. Bears still found in north of Sistema Ibérico in Cuenca . Commoners given the right to kill bears, leading to massive decline. 19th century: Democratisation of firearms. 1935. Around 200 bears still survive in the Pyrenees and Pre-Pyrenees. 1954. Some 70 bears left in Pyrenees . 1962. Bears in Cordillera Cantábrica are separated into two populations. One estimate gives 77 in west and 15-16 bears in east. 1976. Total protection for bears in France . 1979-81 25 bears killed by poachers in the Cordillera Cantábrica. Early 1990's just 80 bears left in the whole of the Cordillera Cantábrica. 2005. Bears in the Pyrenees to all intents and purposes biologically extinct with a scattered population of 14-16 bears throughout the whole range, though may be artificially saved by polemical (on the Spanish side) introduction programme of Balkan bears into French Pyrenees. In contrast the situation of the bear in Cordillera Cantábrica is improving, at least in the "Western" sector (Eastern Cantabrian population at 25 individuals and Western at between 118 and 140 bears). Interestingly, FAPAS President, Roberto Hartasánchez says that contary to what we might think rural depopulation is a threat to bears. There appears to be a certain dependancy (presumably as a food source) of bears on small rural settlements. When these are abandoned bears tend to move away. -Although the Western bear population can now be conidered 'viable' , this does not mean it should be no longer classified as 'endangered'. The two concepts are distinct. Spanish bear still face poison, snares and habitat loss. -Genetic studies by the Museo de Ciencies Naturales have shown that the two Cantabrian bear populations are genetically seperate. -It is necessary to create a bear corridor connecting the two populations. Also FAPAS President, Roberto Hartasánchez says brown bear can only survive in Asturias and the Cordillera Cantabrica. The bear is suffering from the abandonment of villages and therefore traditional such as fruit trees, and the absence of carrion due to the EU ban on leaving dead livestock in the country because of BSE. Also Fapas here. The subtitle of the article is in reference to King Favila who was killed by bear - see Cantabrian Bear was First Spanish Republican (iberianature) . Camille spotted in Navarran Pyrenees (photo). Bear experts from around the world gathered in Somiedo , Asturias to discuss the idea of a 'bear motorway' connecting Asturias with Switzerland . The first step would be to connect the two separate Eastern and Western bear populations in the Cantabrian Mountains . This would then lead through Cantabria (OK) and into the Basque Country (have they seen the network of roads in Euskadi?) and then through the Pyrenees into Catalonia (mmm). From here it would hack across the Massif Central in to the French, Swiss, Italian and Swiss Alps. It would mean burying electricity lines, building road underpasses and planting more forest. The idea will probably fail though by merely attempting it, other species would benefit. Identification. Photo ID of bears carried out by FAPAS. A kilometre a day. A study on bears with cubs showed they moved on average 7 kilometres a week. Censuses on the number of female bears with cubs vary greatly (in 2003 between 6 and 9). Need to standardise results. Bear observations in Spanish Pyrenees 2005. Brown bear population increasing . Second bear found dead in a month was shot. According to the Veterinary Faculty of the University of León , a bear found by hikers on 25th Sept in Palencia died from "traumatic injuries" caused by gun cartridges. Killing a bear in Spain is punished with up to 4 years in prison. The animal was a male of some 15 years, and formed part of the fragile 'eastern' population of 25-30 individuals. The president of the Fundación Oso Pardo, Guillermo Palomero, noted that the death of one of the area's 6-7 females would have been much worse. Investigators are still unsure of the cause of death of the first bear found in Palencia in early September, though it appears not to have been shot. I am unaware as to when the last bear in Spain (as opposed to France ) was shot. Six cubs have been born this year in the Eastern Cordillera Cantabrica, the highest number in at least 20 years. The bears here were on the edge extinction on the early 1990's. See also: Eastern Cantabrian bear population shows timid recovery . At the request of Aragon , Navarra & Catalonia , France to release bears next spring instead of this autumn. Spanish representatives want to first promote awareness among Pyrenean residents and the guarantee adequate funding. Bear spotted in Ordesa, burying dead sheep.. (Diario de Alta Aragon) Grainy ghotos here (Fapas)Review of the use of hidden camaras in following Cantabrain bears (Fapas) Camaras reveal details on individuals, population, breeding, behaviour, threats, etc. Authorities in the Valle de Arán claim that one or more bears attacked a herd of cows three days ago. Four cows were injured, two of which had to be put down. The farmer claims another cow is missing, though this should be taken for the time being with a pinch of salt as false claims against wolves and bears are rife. Is this part of a smear campaign to prevent the release of more bears into the Pyrenees? Bears do sometimes kill livestock but the Aranese authorities were vociferous to the point of hysteria in their opposition last month. Update . The story has been confirmed by reliable sources. Possibly the drought has cut down their other food sources. The lack of carrion since the EU introduced anti-mad cow regulations (see below) may also be playing its part. Following the killing of four cubs by two adult male bears last week in Leon (see Adult male bears kill four cubs in Leon (Nueva España), FAPAS have highlighted the prevalence of bear infanticide in Asturias , specifically in Somiedo, where eight of the nine bear cubs born in the last eight years have been killed by adult bears. While FAPAS sees infanticide among bears as a natural phenomenon, it considers the rate of incidence to be abnormal. Roberto Hartasánchez, the president of FAPAS, notes " Asturias cannot look on as a mere spectator to what is happening to its bear cubs, however natural this may be." He is backed by Miguel Deblibes from the CSIC who also says "such attacks occur when there is a social "disturbance", and a male arrives to a territory and becomes immediately interested in a female on heat",. The reasons why adult bears have killed so many cubs is unknown, though Roberto Hartasánchez says that the incidents falls dramatically in forested areas. More studies are called for. The cub of Canelle, the last totally autochthonous bear of the Pyrenees shot by a French hunter in November 2004, has managed to survive the winter without its mother. The French team of biologists in charge of the reintroduction have discovered its tracks in the beechwoods of the Ossau Valley in the Bearn area, close to the Navarran frontier, the same area where its mother died. It is unusual for a bear of 6-7 months old (now 16) to survive the winter without adult bears. It may well have managed because of the food left out in the area by the biologists during the winter. 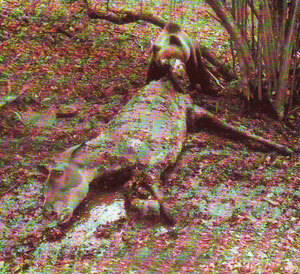 There is the precedent of Melba, also shot by a French hunter, in 1997 . Despite the fear of the fears of the biologists , two of her three cubs managed to survive the winter. Bear move from milk to solid food at around 4-5 months old. 15-17 bears survive in the French and Spanish Pyrenees. (see below) The French biologists are to release 5 Slovenian bears in the Central Pyrenees in the next few months. Bears have recently attacked sheep flocks in the Vall d'Aran, and experts have confirmed the deaths of two sheep. The eastern population of brown bears living on the edges of Cantabria, León, Palencia and Asturias has increased slightly in recent years to 25-30 individuals, with a rise in the number of breeding females. The bear here seems to have recovered from its crisis in the mid 1990's when many predicted its imminent extinction. In 2004 two bear cubs were born in this enclave comparison with five in 2003. Note doubt much of the bear's recovery has been down to the conservation programme which has invested 540,000 euros since 1995 in habitat recovery, monitoring and education. Bears from the eastern enclave are moving more and more into Cantabria. 174 signs of their presence were recoded here last year in comparison with 51 in 1998. Their status, however, remains critical. In comparison, the western population in Asturias , Leon and Galicia is currently made up of 80-100 individuals. Last year it reached a recent record of 11 breeding females. Given the difficulty of establishing a natural corridor connecting these two populations and fact that western enclave seems relatively strong, there are increasing calls to transfer young females to the eastern section to improve the gene pool. Over the last 14 years, the population of the brown bear in the Cordillera Cantábrica has risen from 60 - 80 individuals to 105 - 130. Just 14-16 bears are left in the Spanish and French Pyrenees . It looks like the death of Canelle (see BBC article here), the last autochthonous female bear of the Pyrenees, last autumn at the hands of a French hunter has not been in vain. The public and political attention given to the shooting appears to have spurred on the authorities with the announcement of a joint plan for the recover of the brown bear in the Pyrenees by the Spanish, French and Andorran governments. For the time being the bears are to be released on the French side, beginning with five females next September. The plan involves releasing a total of 15-17 animals over the next five years in order to double the Pyrenean bear population by 2008, which would just begin to form the basis for a possibly viable population in the future. There are at present 14-16 bears left: two autochthonous males in the Atlantic area and between 12 and 14 individuals in the Central Pyrenees (Aran and Pallars valleys and adjoining French regions) from the reintroduction using Slovenian bears in 1997. Although attacks on humans by brown bears are extremely rare, it is important to calm local populations –the Vall d'Aran has voiced it opposition, concerned about the bears frightening away the rich and eating into their snow tourism profits. A series of information campaigns is to be organised, along with the prompt and full payment of any bear damage to livestock, beehives and crops. Clearly protection of habitats is also key. A similar potpourri of measures in the Cordillera Cantábrica has successfully increased bear numbers (from a falling 60-70 to a rising 100 odd in 15 years). Unlike the wolf, the bear is now a source of pride among the vast majority of people in the Cantabrian Mountains . They have also seen tourism increase with the image of the bear at the forefront of all campaigns. According to a recent opinion poll in France , 86% of the inhabitants of the Pyrenees consider the bear as part of Pyrenean heritage. 58% are in favour of reintroduction programmes. The French have asked bears from Asturias to be used because of their genetic similarity. However, their request has been denied as the Cantabrian population is still far from viable. As with previous reintroductions, Slovenian bears are to be used. One bear will roam an area of 2,500 km2 and travel up to 300 kilometres, and so it is important to choose the right spot for release. Despite appearances, the Pyrenees is an extremely modified human landscape with an ever increasing level of impact. Chalets are sprouting like mushrooms along every valleys. Whether the bear is compatible with this Benidormisation of the valleys remains to be seen. The Spanish wildlife group FAPAS has detected the presence of bears throughout the winter a they pass through the Valle del Trubia in search of food. This difference in behaviour of some bears in Asturias may be because temperatures are not as low (for climatic reasons or because this particular valley is lower than the rest of the bear's current range) or because they have been unable to find enough food to build up enough fat reserves in the autumn. Fapas in concerned that a bear wandering in search of food in winter might accidentally get shot during the common boar hunts at this time of year. Following the movement of bears enables Fapas to prevent these hunts taking place at a given time and place.